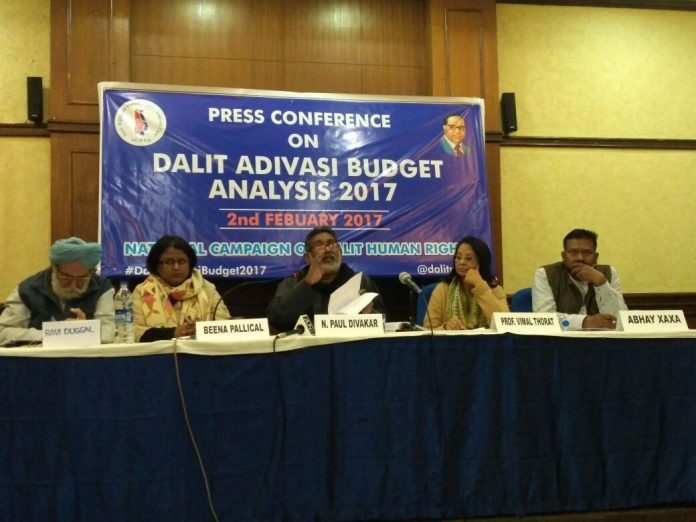 New Delhi: The Union Budget looks like a “very glossed over budget” for Dalits and Adivasis with reduction in allocations for key schemes, said National Campaign on Dalit Human Rights (NCDHR). “Although there is an increase in the allocation, there are several key schemes where the allocation has been reduced, like the post matric scholarship where it has been reduced to Rs.2926 crore starving the one scheme which will directly benefit the youth of the community…the gloss is only a ‘dhikhawa’”, said N Paul Divakar, General Secretary, NCDHR. It is important to point out that in 2017, there was a fundamental shift made towards a ‘welfare model of SC/ST’, revamping Scheduled Caste Sub Plan and Tribal Sub Plan to Scheduled Caste Component and Scheduled Tribe Component (henceforth, SCC-STC). Following this shift, new guidelines were issued by Niti Ayog in December 2017 for earmarking of funds for Development Action Plan for SC & ST (AWSC & AWST) which have shed light on how the funds for development schemes for the SCs & STs have to be allocated by the concerned Ministries. These guidelines were not incorporated in the Union Budget 2018-19. “The projections of historical increase in the allocations for SC are at 35.6% and 28% for ST’s this year hide several harsh realities we have to deal in this election year. The biggest take-away from Budget Speech of Interim Finance Minister is that it ignored its own ministry’s formulated guidelines of December 2017 which had laid very important series of norms for allocating and implementing schemes for SCs and STs. Allocations under CSS and CS towards SC and ST development are to be a minimum, and not less than their proportionate population, which according to Census 2011 is 16.6% for SCs and 8.6% for STs,” NCDHR said. In the current year, Rs. 76,801 crore i.e. 8.16 % of the total eligible Central Sector Scheme & Centrally Sponsored Schemes is allocated for the SCs and Rs. 50,086 crore i.e. 5.34 % for the STs. “The due share of the Scheduled Castes in SCC this year amounts to Rs. 1, 39,660 crore and for Scheduled Castes in STC is Rs. 75,987 crore. There are 9 new ministries / departments for SC’s and 3 for ST’s which are set to implement new programmes along with the existing ones. The share of Dalit & Adivasi women in the gender budget statement amounts to Rs. 6851.48 crore which constitutes 5.2 % of the total gender budget statement which is proposed to be of Rs. 1,31,699.5 crore,” NCDHR added. The NCDHR analysis of last five-year trend of the Scheduled Caste Component plan shows that out of total allocation of Rs. 5,05,015 crore which is the mandate as per guidelines, only Rs. 2,29,243 crore has been allocated. And only Rs. 81,155 crore is a direct allocation, meaning directly benefiting the Dalits. A huge amount of Rs. 1, 48,088 crore has been allocated for non-targeted schemes which can hardly be of any direct benefit to the community. Take for example the fact that Rs. 2,200 crore has been allocated towards Swacch Bharat Abhiyan from SCC and Rs. 1,000 crore from STC but less than proportionate allocation has been allocated towards ensuring alternative employment opportunity to the community engaged in manual scavenging. Similarly, an allocation of Rs. 30 crore has been done under the Self Employment Scheme for Rehabilitation of Manual Scavengers and allocation of Rs. 35 crore has been done for the National Safai Karamcharis Finance & Development Corporation. But more worryingly, massive amount of allocation amounting to Rs.1823.32 crore has been allocated under the Department of Telecommunications and Rs. 3,166 crore has been allocated under the Department of Higher Education which involves major diversion of funds towards setting up and supporting IIT’s, IIM’s, IISER,NIT and others. National Legislation: The policy of allocation of funds is hanging loose post-merger of Plan-Non Plan scenario. This must be legislated and machinery established not only to bridging the gap but for ensuring financial inclusion. Ministries for SC funds – MSJE (Ministry for Social Justice Empowerment) and for ST funds (Ministry of Tribal Affairs) are appointed, there needs to be sufficient resources allocated for an efficient machinery capable of implementing the plans for SC ST welfare and development. Nodal ministries should be empowered to take strict penal measures against the defaulting Ministries and Departments.